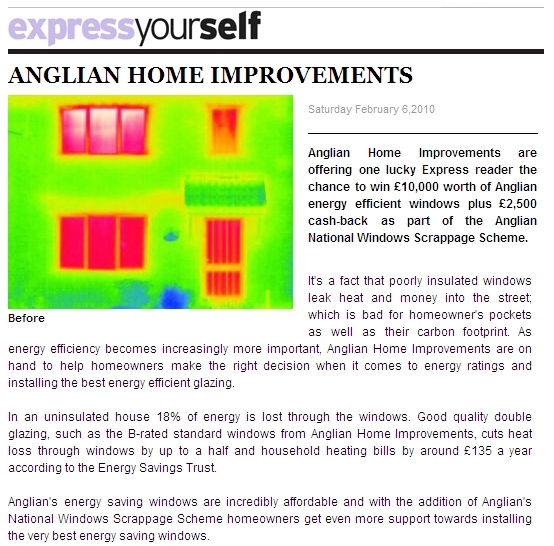 Anglian Home Improvements are offering one lucky reader of the Daily Express a chance to win £10,000 worth of replacment windows and doors from Anglian plus £2,500 cash-back as part of the Anglian National Windows Scrappage Scheme. To enter this fabulous competition is easy. Simply describe in five words Anglian’s energy efficient windows. So what are you waiting for, you need to be “in it to win it” so click here and get creative with your entry. Closing date for entries is Friday 12th March.